Ah. summer. I had about two cups of blueberries that needed to be used or frozen so I made ice cream. I have an old Simac gelato machine that is roughly the size of a Volkswagen Beetle. In DC it was always more trouble to get out than it was to find ice cream. Here in West Virginia, I have some space. During the summer, the Simac sits on a box in the kitchen floor, easily accessible for ice cream making. It is truly indestructible. It does have drawbacks. First there is that size thing. Secondly, it does not have a removable basket. It takes longer to clean the machine than it does to eat the ice cream. Owners of this machine, however, are rabid about them. If you can find a way to make the blades, you will have a thriving business as many owners desperately need replacement blades. 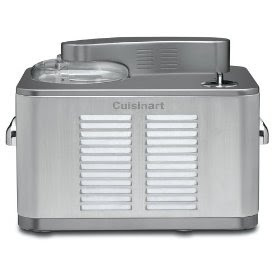 I admit, however, that I covet the Cuisinart ICE-50BC. It has a removable bowl! And is about half the size of my Simac. Ice Cream guru David Lebovitz uses this machine and raves. I rave over his book, The Perfect Scoop. Even with the cleaning, the ice cream was great! 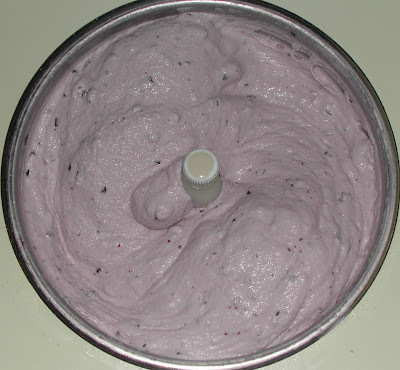 I mix my ice cream with an immersion blender, but a whisk or a mixer will work. Beat the eggs till they are thick and rich. Incorporate the sugar fully. Now you just want to mix in the cream,milk, and sugared fruit, giving it a quick stir. Then add to the ice cream maker. Gently crush about half the berries with a fork and leave half whole. 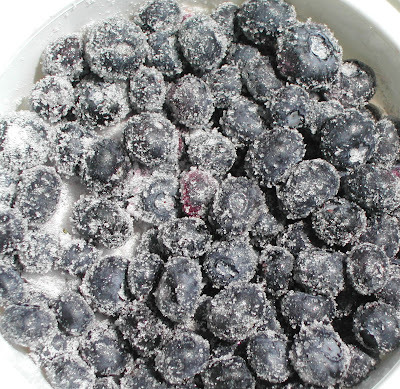 Sprinkle the sugar on the blueberries and let them set about an hour. Beat the eggs until thick. Add the sugar to the eggs, mix well. Add the cream, milk, and sugared fruit, mix to combine. Pour into the ice cream maker following the manufacturers instructions. It should take about 30-40 minutes.